Times are tough in the theatrical world. Once a composer like Verdi could summon a phalanx of opera singers, a 200-strong backing chorus, a full orchestra and magnificent sets. Now we’re down to two men, one pianist, and a couple of hat stands. Plus a lot of hats to put on them, as Verdi’s famous opera is restaged as Aida Abridged. The seriously shaved-down opera was conceived and directed by Greg Homann, and one thing it isn’t short of is creativity. A huge amount of vision and work has gone into it. Not as much as went into Aida un-abridged, of course, but Homann has added fun and frivolity and liberally augmented the Italian libretto with parts in English so those of us not too cognoscenti with Italian can follow the plot. What hasn’t been sacrificed too much is the quality of the singing, with Clint Lesch and Len-Barry Simons both having wonderful voices with a great vocal span, which is handy when you’re playing beguiling women then sonorous pharaohs a moment later. Lesch has adapted the original music for this pocket-sized production, and they’re accompanied by a flawless Wessel Odendaalon the piano. Purists might complain, but the actual opera arias and duets are really very credible. Both actors also have a great sense of timing and the ability to physically convey their emotions. The plot remains largely intact, although neatly truncated, with its epic story about love and loyalty set in ancient Egypt. Egypt is at war with Ethiopia, and Egypt’s General Radames (Simons) is in love with Aida (Lesch), an Ethiopian princess held as a slave by Amneris, an Egyptian princess. Both women are in love with Radames, who is sent into battle against Ethiopia, leaving Aida torn between her love for him and for her country. The actors don madly styled makarapa headgear to show which character they’re playing, and a roll of brown paper that gradually unfurls to illustrate the plot helps enormously. It also adds to the laughs being created by the costume switches, physical actions and the sheer absurdity of it all. Other inventive touches include ostrich feathers dyed green to turn hat stands into palm trees and stencil cut-outs to bring legions of warriors to life against a neatly painted backdrop of the pyramids. There were a few moments when I found my attention wandering, but mostly to ponder the effort behind this wacky reworking, the precarious financial state of the theatre in general, and to wonder how many people will actually come and see it. 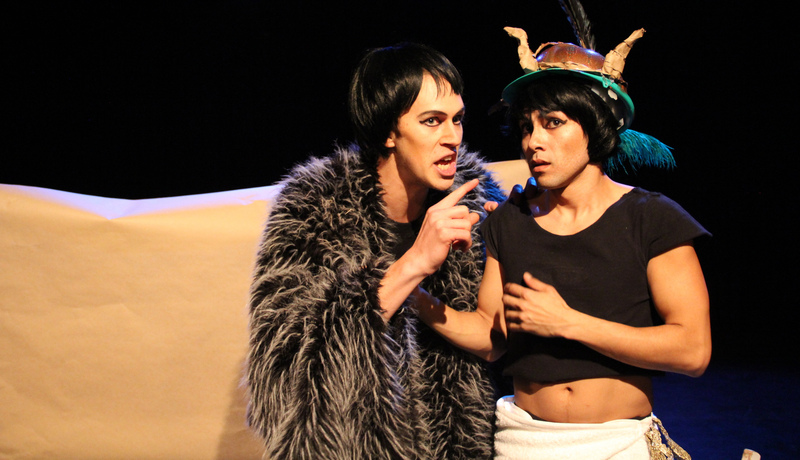 Aida Abridged runs at Sandton’s Auto & General Theatre on the Square until January 31. Tickets from Computicket.